We have been talking a lot about CRUD since 3.0.0, and the reason is because we want move certain features from the WordPress post database table to new database tables. This improves the performance and scalability of those features. Starting with 3.3.0, our webhooks will not use the posts and comments database tables anymore, and we finally have our first feature migrated to custom tables! Webhooks are a feature that 3rd party developers do not use often or heavily customize, so this make it easy to start moving all of the necessary data for webhooks to a new table. 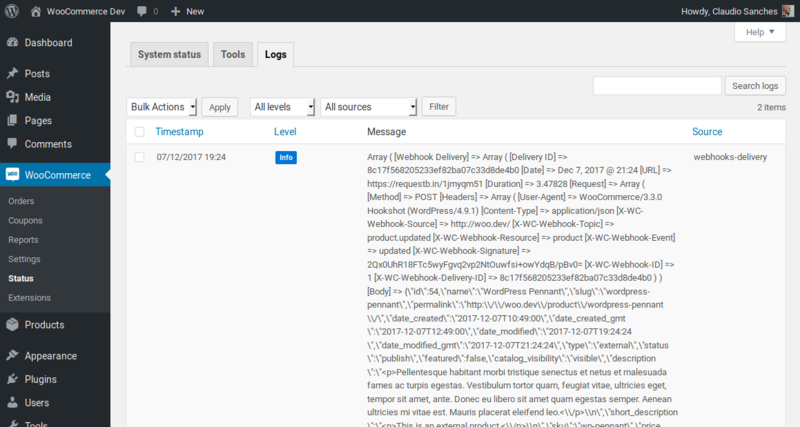 Note: Because of this change all REST API endpoints for webhook delivery logs are now deprecated and will always return as empty. This is because logs now can be saved in the database, as files, or anything else. It is now possible to write custom code to process webhooks. We used to only have options to deliver a webhook as soon as it is triggered or by WP CRON, but that may not be good for everyone. Until we have a third option with our “event queue” you may want to use Redis, Amazon SQS or something else. * @param array      $arg     Delivery arguments. And that’s all folks 👋. WC 3.3 will look great on all the themes!